Wondering How Much Debt Can You Have And Yet Still Be Able To Buy A Home? Concerned that your MasterCard bill and your student loan payments mean you cannot buy a house? But wait there is possibility that you can still use to buy a home. You can use the debt to income ratio for FHA home loans to help you at buying a home. 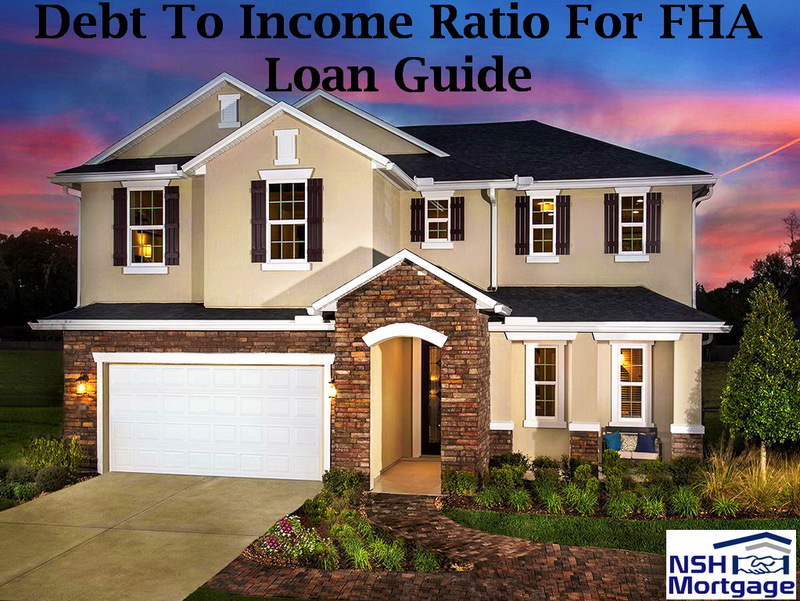 Debt To Income Ratio For FHA Loan Guide And How Much Income Do You Need To Qualify. NSH Mortgage has the wisdom and tools to help you qualify for a Debt To Income Ratio. When you borrow money to buy a home, your lender reviews your credit score. In addition, a lender compares your monthly payments on your debt with your gross monthly income to generate a debt to income ratio, or DTI. Your debt to income ratio includes the minimum payment on each debt listed on your credit report, other debts on your loan application, and the monthly payment for your new mortgage. The maximum debt to income ratio allowed for a qualified mortgage is generally 43 percent. However, in some cases loans purchased by Fannie Mae can go as high as 50 percent. The maximum debt to income ratio for FHA home loans range between 40 and 50 percent for FHA applicants. FHA loans, insured by the federal government, generally offer more forgiving qualification guidelines. They are a good option for borrowers with less than perfect credit or who want to limit their down payment to 3.5 percent. Lenders weigh three characteristics when they underwrite your loan application: debt to income ratio, your loan to value, or LTV, and your FICO credit score. The chart below shows the average characteristics of approved FHA buyers. The factors balance each other, if you want a loan with a below average FICO, you will probably need to be better than average with your down payment or debt to income ratio. On the debt side, your lender includes your monthly housing payment of principal, interest, property taxes, HOA dues if applicable, homeowner’s insurance and mortgage insurance. FHA loans require mortgage insurance. Your debts also include minimum payments on your credit card balances, student loans, installment and other accounts. If your student loan payments cannot be documented, FHA loan guidelines assume a monthly payment of one percent of the balance. Installment loans that will be paid off within ten months will not count as part of your debt to income ratio. However, your lender must include the amount of that payment that exceeds five percent of your monthly income. So if you earn $4,000 a month, and your auto loan has six payments left at $500 a month, you will only be hit with $300 a month. $4,000 income * .05 = $200. $500 payment – $200 = $300. If you are on the edge of being able to qualify, paying down an installment debt to less than ten remaining payments can be a good strategy for loan approval. Your income includes all your gross monthly income, including investment income, interest, rents, and anything that is stable and expected to continue at least three years. Part time or overtime earnings counts, too, if you can document a two year history of that income. If you are self-employed, however, it is your taxable income, plus some adjustments like depreciation, that lenders use. So if your business brings in $300,000 a year, and you have $250,000 in write offs and $20,000 in depreciation, the lender credits you with $70,000 income. $300,000 gross – $250,000 write offs = $50,000. Add back $20,000 depreciation, because it is not a cash expense, and you get $70,000. Gross, before tax, wages of $72,000 a year ($6,000 a month). Interest and dividend income of $6,000 a year ($500 a month). Total income: $6,500 a month. New monthly house payment: principal and interest: $1,200, property taxes: $250, and homeowners insurance: $50, totaling $1,500 a month. Two auto loans: one is $300 a month, and the other is $200, total $500. Credit card balances with minimum payments of $175 a month. Total debt payments: $2,175 a month, including the new housing expense. Debt to income ratio = $2,175 / $6,500 = 33.46 percent. The debt to income ratio for FHA home loans can be expanded to a debt to income ratio of as much as 50%. However, you will need compensating factors, which offset the risk of your higher debt load. Lenders check many dynamics before approving a mortgage, such as your job history, your credit score and your loan to value. FHA guidelines mention specific factors that can compensate for a high debt to income ratio, but borrowers with a credit score below 580 are limited to a debt to income ratio of 43% regardless of compensating factors. If your score is 580 or above, you may qualify for a loan with a debt to income ratio of 47% to 50%. However, having one of these additional qualifications may secure you a larger loan than you would otherwise qualify to get. Cash reserves equal to at least three mortgage payments. FICO score of 680 or higher. Document all future income potential. Minimal increase in your housing payment after the purchase – no more than $100 or a 5% increase, whichever is lower. Buying a Energy Star home, which reduces your monthly utility costs. Significant additional income from bonuses, commissions, part time work or overtime not reflected in your effective income. This could be because you have less than two years of documentation. If you are moving and have a working or a training spouse, who has not yet found a job in your new location, assuming your spouse plans to work. Document a pattern of saving, showing regular deposits to a savings or investment account. Make a larger down payment, like 5% instead of 3.5%. Note that FHA allows lenders to use compensating factors to expand debt to income ratio. It does not require them to do so. If your lender approves you with a high debt to income ratio, that does not necessarily mean you should spend up to your limit. Using half of your gross monthly income for required minimum payments can leave you with little cash for emergencies. And your lender has not considered expenses like child care that can really hurt your cash flow. Be sure to budget for basic items such as food and clothing, insurance and child care and to save for emergencies and long term goals. In the past, guidelines recommended that homeowners spend a maximum of 28 percent of their income on their housing costs. Lenders recommended a maximum debt to income ratio of 36 percent on all debts. If your monthly income is $10,000, there is a big difference between spending $3,600 on your mandatory expenses and a 50 percent debt to income ratio of $5,000.